UPDATE 2:49 AM: Rate of arson has eclipsed the fire department’s ability to control each blaze. Firefighter tells me Baltimore fire department is "totally out of resources"
UPDATE 2:07 AM: Cutting of fire hoses still a concern. UPDATE 2:05 AM: Fires and lootings continue to pop up through the night. Just tried reporting a store break-in and looting at the 7-Eleven on Charles in Saratoga. No operators are picking up 911 calls. Baltimore City Chief's car gets winshield broken by thrown rock while en-route to fire on Smallwood Ave where someone was trapped inside. UPDATE 12:32 AM: More fires. There's a structure fire at N Mount St & Baker St. @BaltimoreFire on the scene. UPDATE 12:12 AM: Compare and contrast: a representative from Obama’s “My Brother’s Keeper” program attended Gray’s funeral today. To this day, President Obama has not once publicly acknowledged the death of Navy SEAL Chris Kyle. There's a structure fire in the 1800 blk of Pennsylvania Av. @BaltimoreFire is on scene. Commish Batts, sounding tired & hoarse confirms this was organized and carried out — at first — by high school students. Y'all, I just cannot use the hashtag #BaltimoreRiots. Today, I saw an uprising. Riots are what happened in Kentucky after the basketball team lost the championship.What we're seeing is an international wave of UPRISINGS. This country spent a decade consuming Black #Baltimore's misery as entertainment on TV but now when real people rise up ppl r appalled. UPDATE 11:22 PM: While Gray’s family gave statements condemning violence, the attorney representing them and Freddie, Billy Murphy, whips up hatred against Baltimore Police. Paints entire department as violent and brutal, then claims police faked gang threats to “divide” the city. Murphy alludes to police kart about gangs: call it's a. "False alarm cooked up to divide this city even farther." UPDATE 11:14 PM: Mayor Rawlings-Blake gives a new statement. Local pastors and gang members are present at a church where Eddie Gray’s family spoke out against the riots.
.@MayorSRB on @wbaltv11 "We can not let our city devolve into chaos because of a small group of criminals."
. @MayorSRB on @wbaltv11 "We will bring order." UPDATE: 11:05 PM: Baltimore public school teacher blames police for first rounds of the riot, saying “I’d be ready to pop off, too,” because police were responding to the “purge” messages by gearing up and interrogating groups of students. UPDATE: 10:55 PM: Police re-deploying, National Guard moving in from another town. We are continuing to redeploy officers across the city to ensure everyone remains safe. UPDATE: 10:28 PM: Loretta Lynch’s first official act as Attorney General will be sending DOJ officials to Baltimore. Vanita Gupta, who head’s the Civil Rights Division, and Director of Community Oriented Policing Services Ronald Davis “will be traveling to Baltimore to meet with faith and community leaders, as well as city officials,” Lynch said in a statement. UPDATE: 10:26 PM: Another journalist attacked. 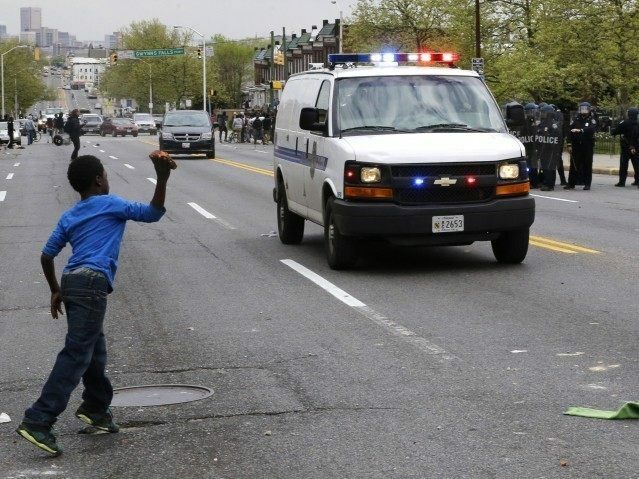 UPDATE: 10:04 PM: Wire services have published a slew of photos depicting the violence and looting gripping Baltimore. UPDATE: 9:57 PM: A pastor expressed anger and sorrow that rioters destroyed a housing structure meant to provide inexpensive, affordable housing for elderly Baltimore residents. 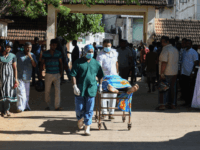 Rioters reportedly injured five journalists. Those of you who can make it to North and Division tell the police you're with Pastor Hickman to help calm the kids down. I need all my men to meet me at New Shiloh Baptist Church now. We have to get these streets under control. UPDATE: 9:44 PM: Rioters shut down Baltimore’s public schools for Tuesday. Reminder: It was high schoolers passing around flyers calling to anarchy and “The Purge” who began to attack cops with bricks. UPDATE: 9:09 PM: Gov. Larry Hogan condemned rioters in a powerful press conference appearance, implicitly criticizing the current mayor for failing to contain the wild violence. 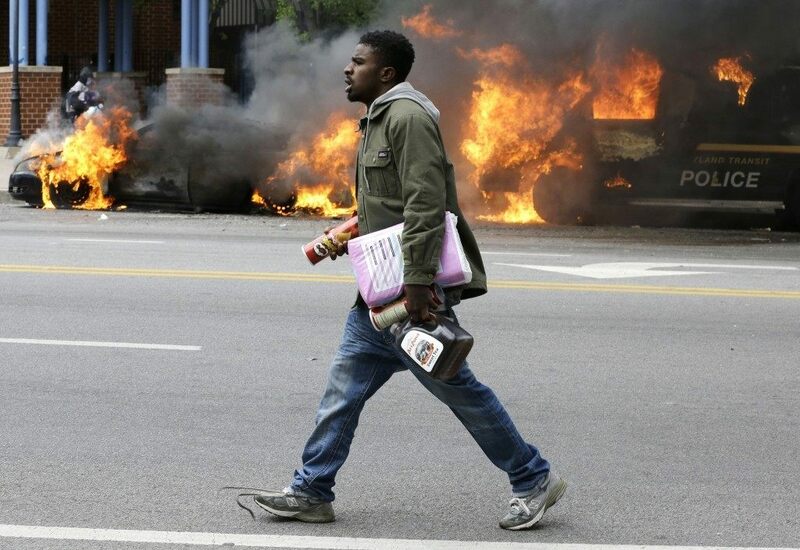 President Obama asked him to go easy on the violent rioters who set fire to police cars and wrecked local businesses. MD Gov. Hogan: “I strongly condemn actions of those who engaged in direct attacks against innocent civilians… & law enforcement officers." MD. Gov. Hogan says he couldn't activate National Guard until Baltimore mayor called –"we are glad that she finally did." Hogan, "glad the Mayor finely called me" re National Guard. Definitely hinting at being dismayed by her delay. UPDATE: 8:52 PM: Former Baltimore mayor Martin O’Malley and possible 2016 Democratic challenger ended a European trip, where he was scheduled to give paid speeches, to fly back to Baltimore. Meanwhile, presumptive Democratic presidential nominee Hillary Clinton tweeted out cliche campaign stickers as riots raged. 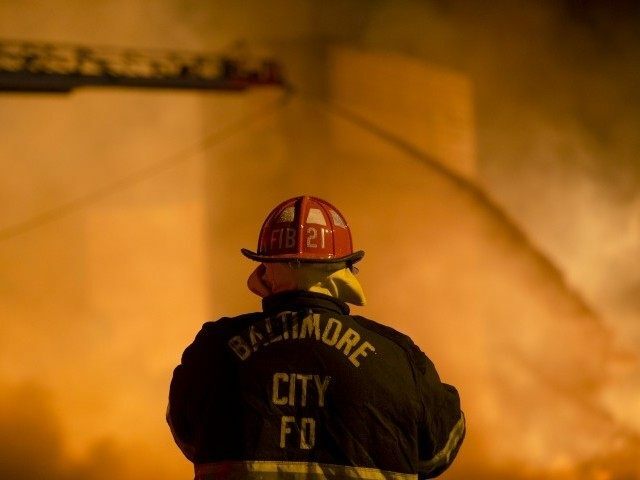 UPDATE: 8:43 PM: The Associated Press reports that 15 officers have been injured by the brick-throwing, arson-committing, fire hose-cutting, liquor store looters who are still rampaging through Baltimore. BREAKING: Police: 15 officers have been injured in Baltimore riot, 2 still in hospital; 2 dozen arrested. Law enforcement intelligence officials have put out a warning that someone has sent a text calling on people to kill “all white police officers” in reaction to the death of Freddie Gray while in Baltimore police custody, raising fears violence could spread nationally, according to safety memos obtained by The Washington Times. Officers are being warned of possible ambushes and urged to change travel patterns and to tone down clothes or emblems that identify them as police. UPDATE: 8:06 PM: Mayor Rawlings-Blake announced a city-wide, week-long curfew following a day of mayhem and destruction wreaked by rioters. Even abolition of #slavery in #US wasn’t based on humanitarian intents but on North-South wars & conflict b/t landowners & industrialists. BALTIMORE (CBS Baltimore) — President Barack Obama spoke with both Attorney General Loretta Lynch and Mayor Stephanie Rawlings-Blake Monday regarding the ongoing Baltimore protests surrounding the death of Freddie Gray. Following her swearing in Monday afternoon, Lynch updated Obama on the protests and death of Gray, which is currently being investigated by the Department of Justice. Rawlings-Blake updated the president on the ongoing looting, violence, and efforts to maintain peace throughout the city. Obama highlighted his commitment to assisting the situation as he continues to receive updates from Lynch and White House Senior Adviser Valerie Jarrett. UPDATE: 7:21 PM: Rival street gangs who promised to unite in order to kill police officers are using their coordination skills to guide media past violent rioters. ANNAPOLIS, MD – Governor Larry Hogan today, at the request of Baltimore City, has signed an Executive Order declaring a state of emergency and activating the National Guard to address the growing violence and unrest in Baltimore City. The governor, along with Lt. Governor Boyd Rutherford and National Guard Adjutant General Linda Singh, will hold a press conference at the Maryland Emergency Management Agency this evening at 8:30 PM. UPDATE: 7:01 PM: Rioters are reportedly cutting fire hoses to stop firemen from putting out the CVS they set ablaze. UPDATE: 6:55 PM: It looks like the National Guard is en route to Baltimore. UPDATE: 6:34 PM: In another act of destruction, rioters have set a CVS store ablaze — one right next to senior citizen housing. UPDATE: 6:28 PM: Rioters have come across a liquor store and ransacked it. Some are chugging expensive alcohol to celebrate social justice, while others look approvingly at destroyed cars. People walking away from looted liquor store holding bottles shouting "Open BAr"
UPDATE: 6:27 PM: Republican Gov. Larry Hogan vows to prosecute rioters, and has put the National Guard on alert. ANNAPOLIS, MD – Governor Larry Hogan is closely monitoring the situation in Baltimore City and has been in contact with Mayor Stephanie Rawlings-Blake office to provide the city with whatever resources are required. The Maryland State Police have been dispatched in a supporting role on the ground, as well as other resources and equipment from various state agencies. “Today’s looting and acts of violence in Baltimore will not be tolerated. In response, I have put the Maryland National Guard on alert so they can be in position to deploy rapidly as needed. I strongly condemn the actions of the offenders who are engaged in direct attacks against innocent civilians, businesses and law enforcement officers. There is a significant difference between protesting and violence and those committing these acts will be prosecuted under the fullest extent of the law. UPDATE: 6:24 PM: The Baltimore Orioles announced Monday evening that the riots forced them to postpone their game. UPDATE: 6:10 PM: Torrey Smith, a wide receiver for the San Francisco 49ers, harshly criticized the teenage looters and rioters, condemning the violence they inflicted on the city. UPDATE: 5:59 PM: Maryland State Police are sending reinforcements to Baltimore. Meanwhile, looters are ripping apart a cash-checking service. UPDATE: 5:48 PM: The rioters have left enormous destruction in their wake, and some are posing in front of burning cars for pictures to send to friends. UPDATE: 5:43 PM: Riots and violent “flash mobs” are typically organized by black teenagers on social media and via texts. Low phone batteries appear to have discouraged the rioters. Things have calmed down. Phones are dying. Back to the office. Community assn president: "they'll be back tonight." UPDATE: 5:38 PM: President Obama and Attorney General Loretta Lynch have convened a meeting in the White House. Major Garrett of FOX News reports that all media are barred from the meeting — except for still photographers. UPDATE: 5:31 PM: Police are begging parents of the high schools calling for anarchy, looting businesses and assaulting police officers to take them home and off the streets. 2/2: …we are asking for PARENTS to please bring your children home. We don't want to see anyone get hurt. 1/2: We are asking for the MEDIA to assist us in relaying this message. Due to the large number of juveniles in these violent groups…..
UPDATE: 5:27 PM: A CNN journalist was injured and taken to a hospital. A @CNN Washington DC based video journalist was attacked and injured in the Baltimore riots and transported by an ambulance. Sharpton said the march from Baltimore to Washington is designed to call attention to Gray — as well as others before him, including Walter Scott, who was shot by a police officer in North Charleston, S.C. — to Loretta Lynch, the incoming U.S. attorney general. UPDATE: 5:08 PM: Baltimore Police Capt. Eric Kowalczyk vowed to investigate the “lawless individuals” who are rampaging through Baltimore and attacking police officers. UPDATE: 5:04 PM: Police has sustained broken bones after black Baltimore high schoolers calling for “The Purge” struck them with heavy bricks, rocks, and pipes. One officer is unconscious, non-responsive. The city’s transportation has been crippled by the raging violence and residents are urged by city officials to avoid several, out-of-control areas. UPDATE: 4:48 PM: Rioters are throwing pipes, chucks of concrete at police, and setting things on fire, according to a CNN reporter. UPDATE: 4:44 PM: Seven police officers have suffered injuries, according to reports. UPDATE: 4:37 PM: Baltimore Police Capt. Eric Kowalczyk informed reporters that criminals responsible for damages and assault will be put in jail. UPDATE: 4:34 PM: The rioters continue to tear apart everything in their path, including a photographer and now a police car. UPDATE: 4:30 PM: The niece of Dr. Martin Luther King Jr. blasted Mayor Rawlings-Blake for “inviting violence” into Baltimore in a letter obtained by Breitbart News. Your invitation to “give space for those who want to destroy” is unbelievable. This interpretation of rights to free speech is dangerous Ma’am. In 1963, my father Rev. AD King, after the firebombing of our home in Birmingham, Alabama, urged hostile protestors to abandon violence and turn to God in prayer instead. Thank God they listened to him, and the even greater voice of his brother, my Uncle MLK, during those turbulent days. Now, you are inviting violence to your city? Who, Ma’am, will incur the moral and economic costs of picking up the pieces? The innocent taxpayers? We at www.restorethedream2015.com are very concerned. Ma’am, people are not entitled to pillage and destroy. That is just plain wrong. 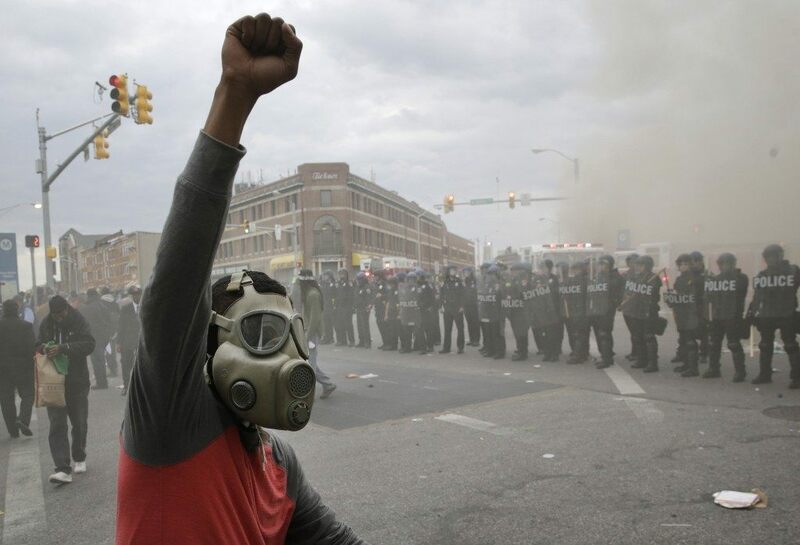 Our affiliates on the ground in Baltimore are willing to help quell the violent tide. And make no mistake about it; something must be done to save our cities. 1. Money spent on public schools then vs. now. 2. Amount spent on social welfare payments then vs. now. 3. The size of Government Bureaucracy then vs. now. 4. The number of black elected officials then vs. now. 5. Number of black children born in Baltimore to an intact nuclear family. 6. Number of Black lives MIA by abortion and incarceration. If you look at all six questions/comparisons what you will see is the only statistics to have decreased (1965 to 2015) is the number of black children born in intact nuclear families. Something is wrong. We must stop the killing and advance the healing now! Several Baltimore police officers sustained injuries after black rioters, angry at the death of long-time drug dealer Freddie Gray, hurled bricks and other objects at them Monday afternoon. The Mondawmin Mall and the University of Maryland closed down after fliers calling for “The Purge” circulated — while Baltimore high school students often circulate leaflets calling for the total suspension of law as a part of a gang initiation, businesses frightened by the latest plea for violent mayhem shut down hours ahead of the 3 p.m. riot. Several cops were injured by juvenile and adult rioters who hurled bricks at them. Here at Mondawmin. Students everywhere. Police line. Officers are ducking bricks and bottles being thrown at them. Crazy. During a Saturday briefing, Baltimore Mayor Stephanie Rawlings-Blake told the city her government allowed black rioters to smash police cars and terrorize residents. “While we tried to make sure they were protected from the cars and the other things that were going on, we gave those who wished to destroy space to do that, as well,” she said.